Structural bioinformatics is the branch of bioinformatics which is related to the analysis and prediction of the three-dimensional structure of biological macromolecules such as proteins, RNA, and DNA. It deals with generalizations about macromolecular 3D structure such as comparisons of overall folds and local motifs, principles of molecular folding, evolution, and binding interactions, and structure/function relationships, working both from experimentally solved structures and from computational models. The term structural has the same meaning as in structural biology, and structural bioinformatics can be seen as a part of computational structural biology. Selection of Target - Potential targets are identified by comparing them with databases of known structures and sequence. The importance of a target can be decided on the basis of published literature. Target can also be selected on the basis of its protein domain. 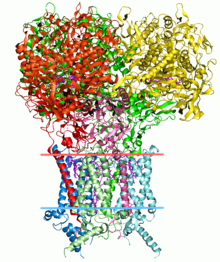 Protein domain are building blocks that can be rearranged to form new proteins. They can be studied in isolation initially. Tracking X-ray crystallography trials - X-Ray crystallography can be used to reveal three-dimensional structure of a protein. But, in order to use X-ray for studying protein crystals, pure proteins crystals must be formed, which can take a lot of trials. This leads to a need for tracking the conditions and results of trials. Furthermore, supervised machine learning algorithms can be used on the stored data to identify conditions that might increase the yield of pure crystals. Analysis of X-Ray crystallographic data - The diffraction pattern obtained as a result of bombarding X-rays on electrons is Fourier transform of electron density distribution. There is a need for algorithms that can deconvolve Fourier transform with partial information ( due to missing phase information, as the detectors can only measure amplitude of diffracted X-rays, and not the phase shifts ). Extrapolation technique such as Multiwavelength anomalous dispersion can be used to generate electron density map, which uses the location of selenium atoms as a reference to determine rest of the structure. Standard Ball-and-stick model is generated from the electron density map. Analysis of NMR spectroscopy data - Nuclear magnetic resonance spectroscopy experiments produce two (or higher) dimensional data, with each peak corresponding to a chemical group within the sample. Optimization methods are used to convert spectra into three dimensional structures. Correlating Structural information with functional information - Structural studies can be used as probe for structural-functional relationship. Leontis NB, Westhof E (2001). "Geometric nomenclature and classification of RNA base pairs". RNA. 7 (4): 499–512. doi:10.1017/S1355838201002515. PMC 1370104. PMID 11345429. Richardson JS (1981). "The anatomy and taxonomy of protein structure". Adv Protein Chem. Advances in Protein Chemistry. 34: 167–339. doi:10.1016/S0065-3233(08)60520-3. ISBN 978-0-12-034234-1. PMID 7020376. Ramachandran GN, Sasisekharan V (1968). "Conformation of polypeptides and proteins". Adv Protein Chem. Advances in Protein Chemistry. 23: 283–438. doi:10.1016/S0065-3233(08)60402-7. ISBN 978-0-12-034223-5. PMID 4882249. Ramachandran GN, Ramakrishnan C, Sasisekharan V (1963). "Stereochemistry of polypeptide chain configurations". J Mol Biol. 7: 95–9. doi:10.1016/S0022-2836(63)80023-6. PMID 13990617.